World Wide Slam Kings, and one of the hardest working bands in death metal, INGESTED have announced an extensive round of dates in March and April. 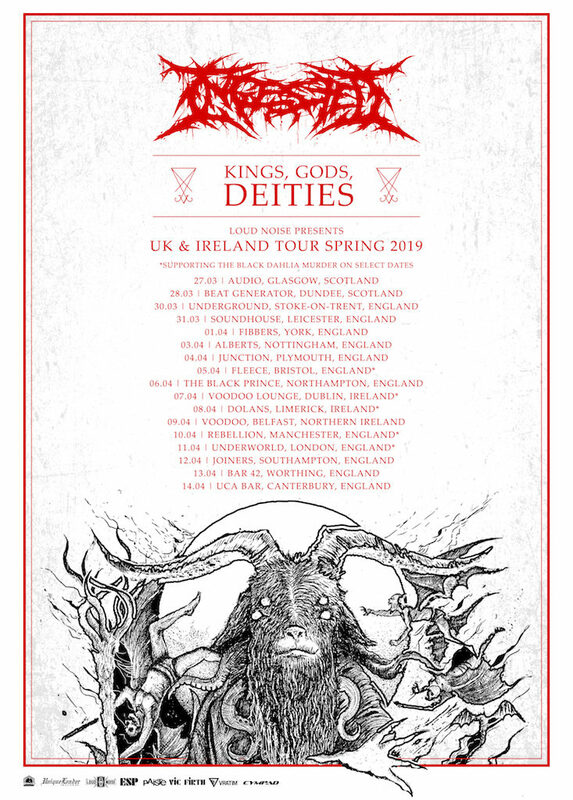 The “Kings, Gods, Deities” tour, which will see the Manchester based band playing a number of headlining shows as well as supporting The Black Dahlia Murder, runs from March 27 to April 14 and will cover a massive portion of the UK and Ireland. The band commented, “After a short break from touring The Level Above Human in 2018, we have been working on our most extensive UK tour in our 13 year history, 17 shows across the UK and Ireland with some select dates supporting The Black Dahlia Murder. This is only the beginning of 2019 for us. Stay tuned for more announcements in the coming weeks! INGESTED have also entered the studio recently to begin recording a new EP and follow up to their career defining 2018 album The Level Above Human. More details forthcoming VERY soon.